Military-World Website — Canada will ship another 20 tanks to Afghanistan in the fall of 2010 to replace those that have been destroyed by insurgents or worn out through repeated use. The Leopard 2 tanks will be shipped directly from Germany, where they are being refurbished, to Kandahar starting in September. Although the tanks will only be on the ground for nine to 10 months before they have to be shipped back when the Canadian military mission ends in July 2011, Defence Department officials say the armoured vehicles are essential. 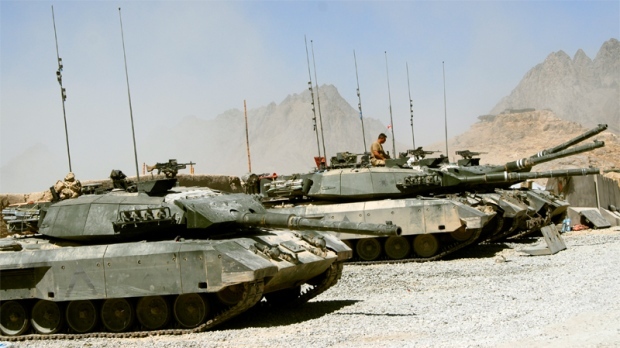 The cost of shipping the tanks from Germany to Afghanistan has not been determined, as that will depend on the type of transport used, according to DND spokeswoman Annie Dicaire. The government spent $1 million to transport each tank when the first group of Leopards were originally sent from Canada to Kandahar in the fall of 2006. At the time, it used commercial aircraft and U.S. military planes. Since then, Canada has received its own C-17 transport aircraft, which could be used to move the Leopards. The Canadian Forces already had deployed 20 Leopard 2 tanks to Afghanistan and before that as many as 15 Leopard 1s. Dan Ross, the Defence Department’s assistant deputy minister for materiel, told the Senate earlier this year that several tanks had been damaged. Military officers say insurgents have damaged three Leopards beyond the level of repair available in Kandahar. Replacement parts are in short supply, making repairs on the tank fleet difficult. The government did not put in place a proper system for parts, those familiar with the tank project pointed out. Defence Minister Peter MacKay had approved the deployment of 20 more Leopard 2s in the spring, but details of when the tanks would arrive in Kandahar hadn’t been figured out at that time. Military officers say the tanks save lives by providing soldiers with a high level of protection. When he was in charge of the army, Gen. Rick Hillier called the Leopards a “millstone” around the military’s neck and said they had limited use for Canada. The army was in the process of destroying or selling its Leopards when the request came in from officers in Kandahar that the tanks were needed. Since then, the tanks have been used extensively in Afghanistan, saving lives of troops in the process, officers say. Canada is spending $1 billion on the tank project, which saw the purchase of 100 used Leopards from the Netherlands. The tanks are being refurbished by the manufacturer, Krauss Maffei-Wegmann of Germany. That firm was awarded an $87-million contract in June for the repair and overhaul of some of the armoured vehicles.